Due to the great need for and enormous response to last week’s free cancer screenings, we will be holding them again this Friday, February 25. For more information, please call 347-262-2305 or 347-885-9215. –Wednesdays (except holidays) 11:00 am—3:30 pm at SUNY Downstate Medical Center, 470 Clarkson Ave, Suite C, Brooklyn, NY. No appointment is needed—Free blood sugar test; cholesterol test; blood pressure; height and weight measurement. For more information call 718 270 3739. 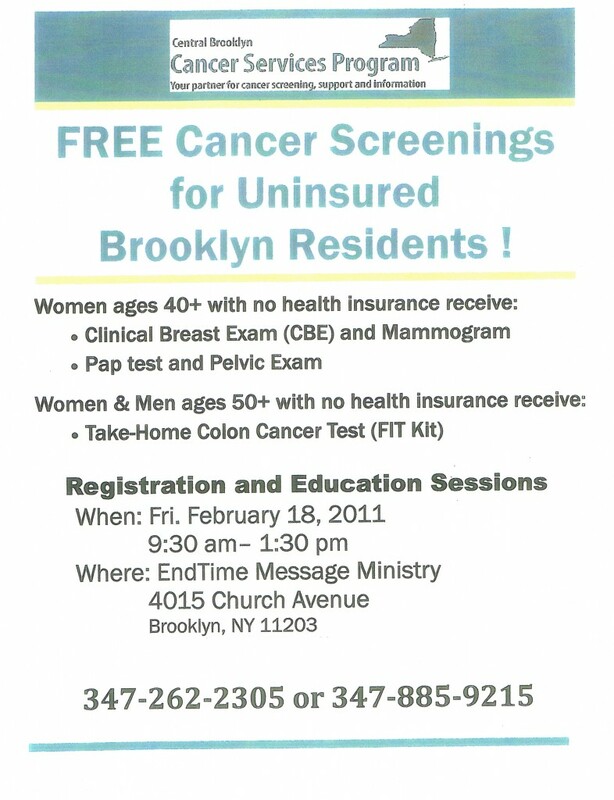 FREE Breast, Cervical and Colon Screenings (Cancer Services Program of Central Brooklyn). For Brooklyn Residents With No Health Insurance (FREE Clinical Breast Exam, Mammogram, and Pap test for women 40 years and older and FREE Colon Cancer Screening for men and women 50 years and older). For more information call 718 270 8846.